Once upon a time, nerds were ridiculed and taunted. But now, as society advances, with computers becoming a daily necessity and intelligence becoming more important than brawn, Nerds are the new leaders. Because of that, Nerd Chic has evolved, a style based on the nerd classics such as glasses and argyle and giving a new modern twist. if you think nerd Chic is the right style for you, keep on reading. Start with glasses. If you are already wearing glasses that's great, if you don't need glasses, then look into getting non-prescription ones if you are willing to take the leap. The two best kind of glasses to wear for nerd chic are the large 'Capote' style glasses. 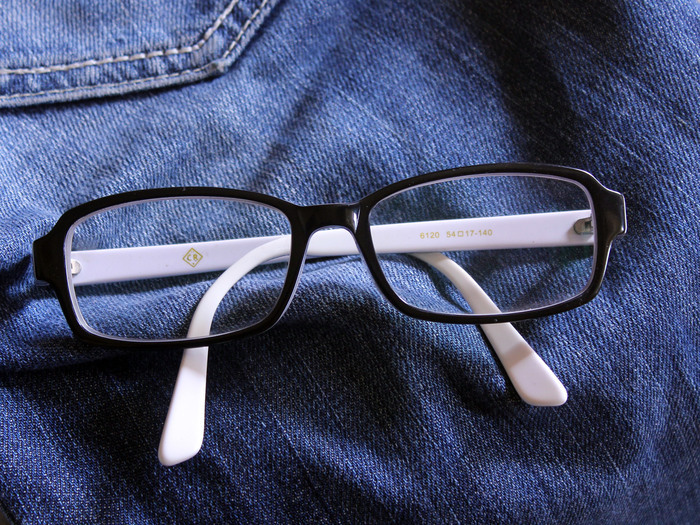 Or the thick rimmed glasses. 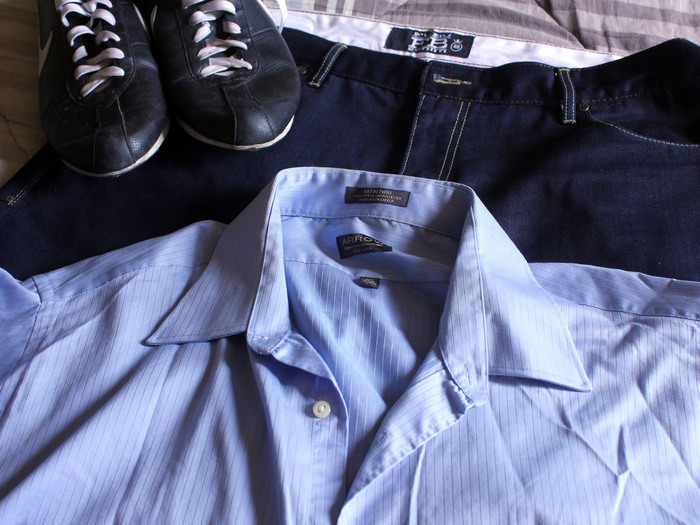 For clothing, wear a button-up shirt, preferably a solid color, buttoned up to the second button. Now you can layer this with a variety of different things: a complimentary-colored sweater vest, pinstriped vest, argyle sweater, simple cardigan (perhaps in grey or blue), or slim track jacket. Top layers for colder weather include pea coats and corduroy jackets. For pants, you can go with simple dark-washed jeans. Skinny jeans go well, but if you are uncomfortable, then loose but not baggy pants are okay. Shoes can be anything simple and sleek. Sports shoes and runners are a no, because they are too clunky and, let's face it, you aren't the most athletic. Converse, Vans or any kind of canvas shoe are good. Accessory-wise there is a variety of things to complete the look. 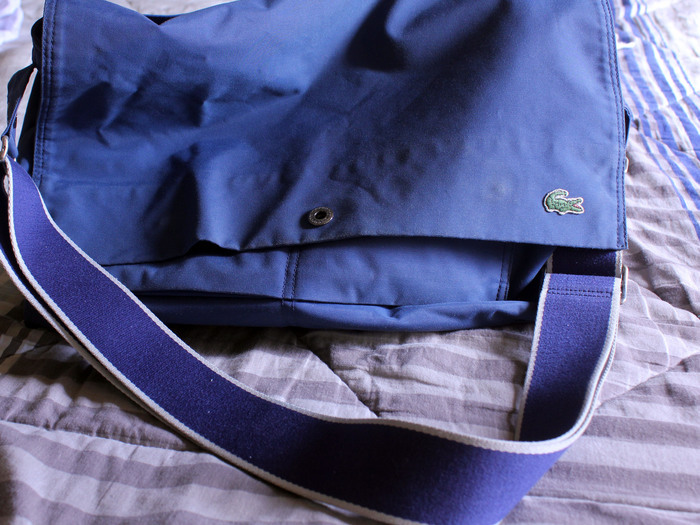 Have a canvas bag, messenger bag, or any bag slung over one shoulder. A thick paperback that is dog-eared and old. Buttons on your chest or on your bag (only a few, don't go over board). A tie or a scarf. Make sure your shirts fit. Button-up shirts are classy and attractive alternatives to crew-neck tees, but oversized ones look like pajama tops, or a clueless frat boy's attempt to dress up. The shoulder seams should hit the edge of your shoulders--if they fall on your bicep, your shirt is too big. Similarly, the bottom of your shirt should not pass your crotch. Untucked, it should hit more or less around the hipbone. Instead of a dress shirt, you can wear a simple turtleneck and still pair that up with a vest in the wintertime. Try a variety of patterns: stripes, pinstripes, diamonds, argyle, or grid. Wear bright, contrasting colors to stand out and look retro. When choosing a button-up shirt, look for comfortable, good quality items. Shiny materials and polyester are to be avoided. Fashionistas will disdain this rule, but it is best to err on the side of using only black or brown in a given outfit as opposed to combining the two. All shades of grey make fantastic neutral items that go with both brown and black; consider mixing more grey into your wardrobe if you find it hard to limit yourself to one neutral color per outfit. Another alternative is the polo. Pastel polos tend to be the territory of the preppy or country club set; look for attractive, bold, deep, or rich colors with nondescript labels, such as Target. Tucking one's shirt in can look hip and "nerd chic" or simply dorky, so use your discretion. A button-up shirt tucked into slim fitting pants/nice dark jeans is the best way to pull this off; a slim figure also helps. Baggy slacks will ruin the look, and tucking in regular t-shirts is utterly verboten. Beware of short-sleeved button-up shirts. These often look cheap, tacky, and unattractively nerdy, though a high-quality fabric and slim cut can result in an okay shirt, and plaid cowboy shirts can look slick with short sleeves as well. Slim, straight-legged Levis are good, timeless, go-to jeans that flatter many men and match nearly everything. Bootcuts and calf-hugging skinny jeans look excessively trendy by comparison.